There is evidence that a distinct pattern of alcohol consumption is emerging across the world and is a cause for concern because of its relationship with a range of health and social problems. Its visibility, particularly its high involvement of young people, makes this not only an issue for public safety and order in many countries, but also a highly contentious and politicized subject. This book examines the rapid and heavy drinking behavior by young people, described in a number of countries, positioning it within its appropriate social, historical and cultural contexts. The book argues in favor of a new term, “extreme drinking,” to fully encapsulate the many facets of this behavior, taking into account the underlying motivations for the heavy, excessive and unrestrained drinking patterns of many young people. It also acknowledges the drinking process itself and accommodates greater focus on outcomes that are likely to follow. In many ways, “extreme drinking” is not so far removed from other “extreme” behaviors, such as extreme sports – all offer a challenge, their pursuit is motivated by an expectation of pleasure, and they are, by design, not without risk to those who engage in them, others around them and society as a whole. 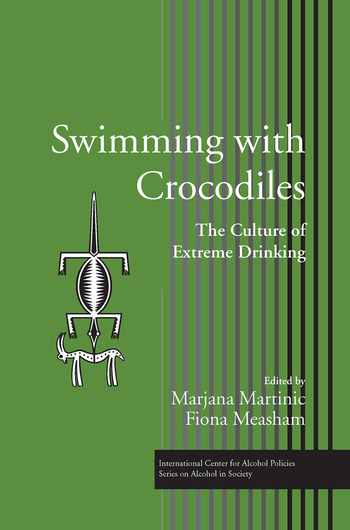 Edited by Marjana Martinic and Fiona Measham, Swimming with Crocodiles is the ninth volume in the ICAP Book Series on Alcohol in Society. The authors discuss the factors that motivate extreme drinking, address the developmental, cultural and historical contexts that have surrounded it, and offer a new approach to addressing this behavior through prevention and policy. The centerpiece of the book is a series of focus groups conducted with young people in Brazil, China, Italy, Nigeria, Russia, South Africa, and the United Kingdom, which examine their views on extreme drinking, motivations behind it and the cultural similarities and differences that exist, conferring at once risk and protective factors. Editors. Contributors. Martinic, Measham, A Case for the Term “Extreme Drinking.” Measham, A History of Intoxication: Changing Attitudes to Drunkenness and Excess in the United Kingdom. Nahoum-Grappe, Beyond Boundaries: Youth and the Dream of the Extreme. Choquet, Case Study: Drinking Among Young People in France. Leigh, Lee, What Motivates Extreme Drinking? Measham, Case Study: Drinking Among Young People in the United Kingdom. Focus Group Results. Gorgulho, Da Ros, Brazil. Newman, China. Tempesta, Italy. Odejide, Omigbodun, Ajuwon, Makanjuola, Bamgboye, Oshiname, Nigeria. Koshkina, Russia. Makan, South Africa. March, United Kingdom (Scotland). Leverton, Evans, Stakeholders and Their Roles. Martinic, Alexander, Extreme Drinking, Young People, and Feasible Policy. Pérez-Fragero, Case Study: Botellón in Spain. Gorgulho, Tamendarova, Tackling Extreme Drinking in Young People: Feasible Interventions. Kilmer, Larimer, Case Study: United States: Drinking Among Sorority and Fraternity Students. Martinic, Measham, Afterword. Annex 1: Procedures for Focus Groups on Extreme Drinking. Annex 2: Guiding Questions for Focus Groups. Index. Marjana Martinic, PhD, is Vice President for Public Health at the International Center for Alcohol Policies (ICAP, U.S.A.). She has published extensively in the fields of neuroscience and alcohol policy. Her previous book, Reasonable Risk: Alcohol in Perspective (2004; co-authored with Barbara Leigh), is volume seven in the ICAP Book Series on Alcohol in Society. Fiona Measham, PhD, was appointed to Lancaster University (U.K) in 2000 and is Senior Lecturer in Criminology in the Department of Applied Social Science. She has over 20 years of experience publishing in the fields of alcohol and drug studies, gender, licensed leisure, and cultural criminology.